Thank you for your inquiry on Jets.com for a private charter. You will be contacted shortly by a private aviation specialist who will answer any questions, and provide you with a firm quote for your upcoming charter trip. Get 5 free hours with the purchase of any 25 Hour Jet Card. To claim this offer or speak with an advisor, please fill out the form below. The Most Competitive Prices In The Industry - If you are looking for superior service, access to the best fleets in private jet charter, and the most competitive pricing available today, then Jets.com is simply the private jet broker for you. No Long-Term Commitments - It’s a simplified and cost effective way to experience the most luxurious and time saving experience in private aviation today. No Hidden Costs - Absolutely no additional costs (no fuel surcharges, dead head charges, additional overnights, repositioning or taxi-time). An all-inclusive price that truly is all-inclusive. Guaranteed Availability - Membership will allow you to be rested, relaxed, recharged and feeling your best. It grants you guaranteed availability to our exclusively managed fleet of prime aircraft 24 hours a day / 365 days a year. Personalized Service - From the first conversation your aviation specialist will begin to understand and learn what will work best for you. 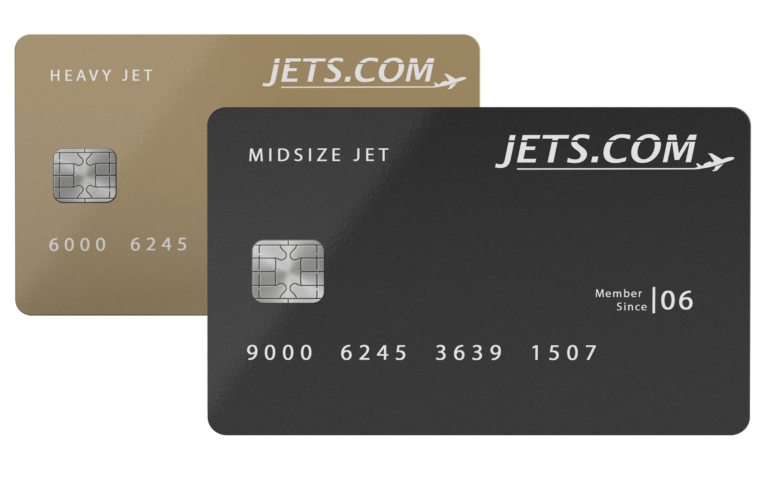 Our goal is to ensure that you purchase the correct Jet Card Membership Program that will meet your needs and deliver the most flexible possibilities that fit your top priorities. Our programs are simple and exciting and are unmatched in quality, safety, service and in price. As you can see our program is brought to you at fixed hourly rates with absolutely no additional costs (no fuel surcharges, dead head charges, additional overnights, repositioning or taxi-time). An all-inclusive price that truly is all-inclusive. A Jet Card is a prepaid card, bought in 25-hour increments, that is redeemed to book a flight on one of our private aircrafts with as little as 24-hour notice. It’s a simplified and cost-effective way to experience our safe and luxurious private travel! Do you charge a separate adjustable fuel surcharge? Absolutely not, we ensure our program is all inclusive with no hidden or changing costs. Am I charged for repositioning, taxi, waiting or any other charges? No you are not. Our programs are all-inclusive programs. You are only billed for time in the air and nothing more. Can I upgrade or downgrade without penalties? Yes, no penalties for downgrading or upgrading in aircraft size, we only ration your hours up or down depending on the class of jet. Is it a use it or lose it proposition with jet card hours? All membership hours never expire. You can carry the hours over with no penalties and they can also be transferred to whomever you wish at anytime. Yes, you can utilize as many aircraft as you desire. If you choose to you can have multiple aircraft in the air at the same time. Does the card holder have to be on board the aircraft? The card holder does not have to be on the aircraft, but does have to grant permission for the new lead passenger. How much notice do you require to book an aircraft? We require 24 hours advanced notice for all U.S. trips and 72 hours advanced notice for international trips to book your aircraft. On “Peak Holiday Travel days” we require 96 hour advanced notice to book. Are there any additional fees with your program? The only additional fees on membership pricing are for Premium Catering, Ground Transportation, De-Icing.